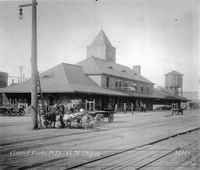 The North Yakima Depot carries to an extreme the notion of using the center portion of the building as a decorative element. The tapered shingled walls of the tower derive from both the Goodrich Avenue Church (1886) and St. John the Divine Episcopal Church (1898-99), and the tower has little function except to support a clock and provide for an open deck. The half-timbered design differs from the Little Falls Depot in that it seems to be German- or central European-inspired (the English did not build wood towers). The large chimney is for a fireplace in the waiting room, a common feature in depots of the era. The chimney does not reflect the Germanic influence of the depot's otherwise unified design. 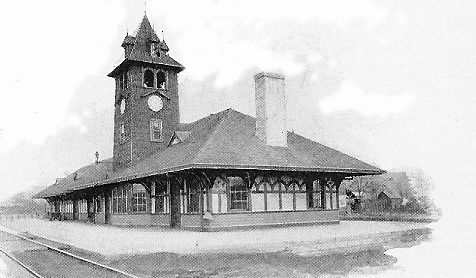 The depot was enlarged within a few years of its construction and was later replaced.